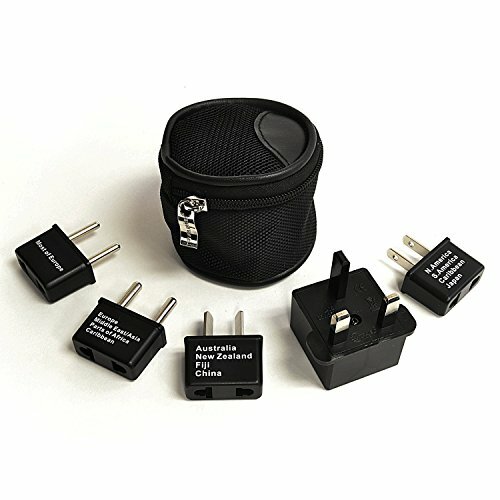 This set of 5 ungrounded adapter plug is designed to adapt to most outlets found worldwide. For international use with dual voltage appliances or with electricity converters / transformers. Each adapter is marked with the country or region for your convenience and includes a nylon zipper pouch for carrying. These adapters do not change the Voltage. Please check the voltage standard for the travel destination and use a Voltage converter with the adapter if needed. (example, Europe uses mainly 230 Volts). Many electrical devices such as AC/DC chargers for Laptops, cameras etc allow a multi range Voltage (110-240 Volts) and eliminate the need of a Voltage converter. Sometimes electrical device have a switch for either 120 or 230 Volts (remember to set back!). Please check the specifications on your equipment. Powering a 120 Volts device with 230 Volts can destroy the equipment and cause fire.